Willow and I have a group of friends we met through the dive shop I recieved my SCUBA certification through. Twice a year the group gathers at the Albion River Campground in Albion, CA for a weekend of abalone diving and feasting which we make every effort to attend. With family and friends the group is usually between 20 and 30 people and three to five of Willow’s canine friends. Maybe half that number are active ab divers, the humans not the dogs. 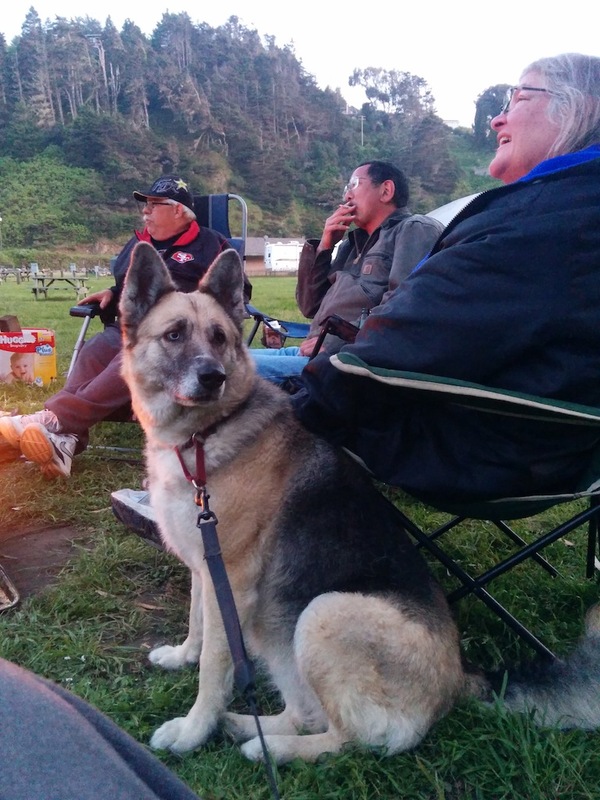 The usual plan is to arrive on Friday, setup camp and catch up. Saturday morning is the first big ab hunt and we can usually fill up the two Zodiacs that regularly come up for the weekend. Sure, you can just walk out from the beach and possibly get an undersized (relatively, not legally) abalone but that area is usually picked over pretty well and the tide, waves and boat traffic make it a less than ideal location to have a snorkel in your mouth, ears underwater and your eyes looking down towards the sandy bottom. 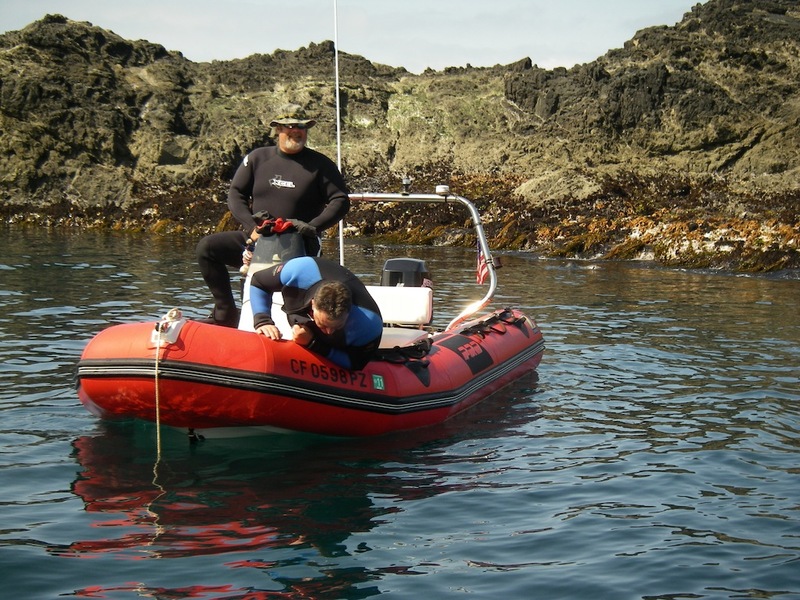 The huge bonus of the Zodiacs is that we can get out of that little bay and around the point to a couple of great little areas protected from incoming surf and impossible to access from the road on foot. 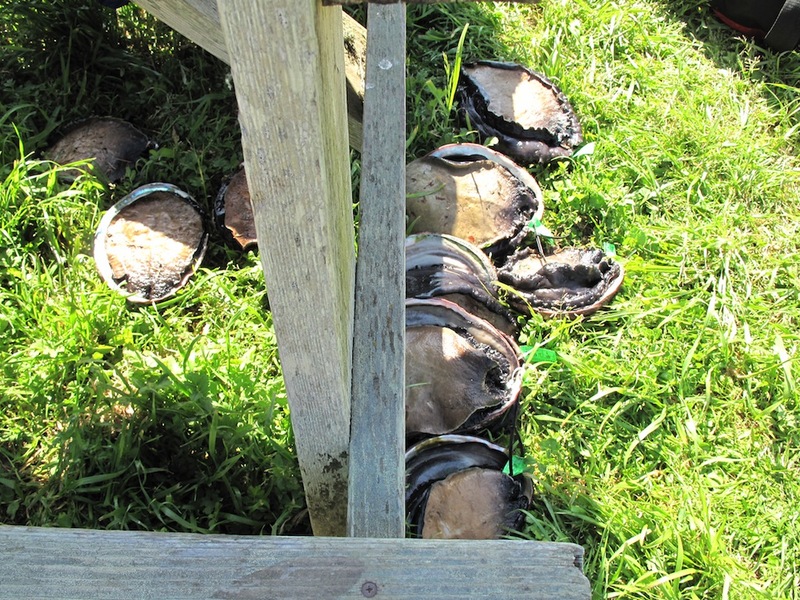 Depending on weather conditions we have had amazing days when every single person gets their three abalone a day limit. You can get abs in as little as five feet of water and, if you’re a good diver, there are 9+ inch ones to be had in from 15-20 feet. The joke is, sometimes it is so easy it’s more like shopping than hunting. Truth be told I am not the world’s best Abalone diver. As a SCUBA diver I like having air and breathing underwater. Holding my breath is just not my thing. I’ve had times when conditions were perfect that I limited and others in not so great conditions when I got skunked. One thing I have come to understand is that I like eating abalone much more than catching abalone. So now, maybe, one in every five trips I’ll bring all my abalone gear and get wet and cold and sandy and tired. The other four times we show up for the party which is much more relaxing. 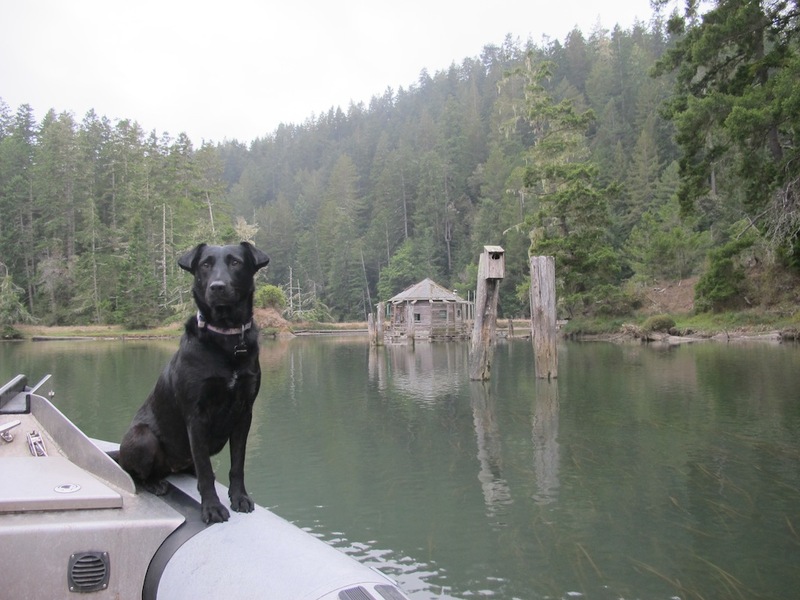 Those times, when the hunters are out on the water, Willow and I can go down to the beach for a romp or on a hike up the river or just hang out around camp and read and relax catch up with friends. Saturday night is the feast and it is always a good one. The normal thing is that those who limited donate an abalone to the feast. 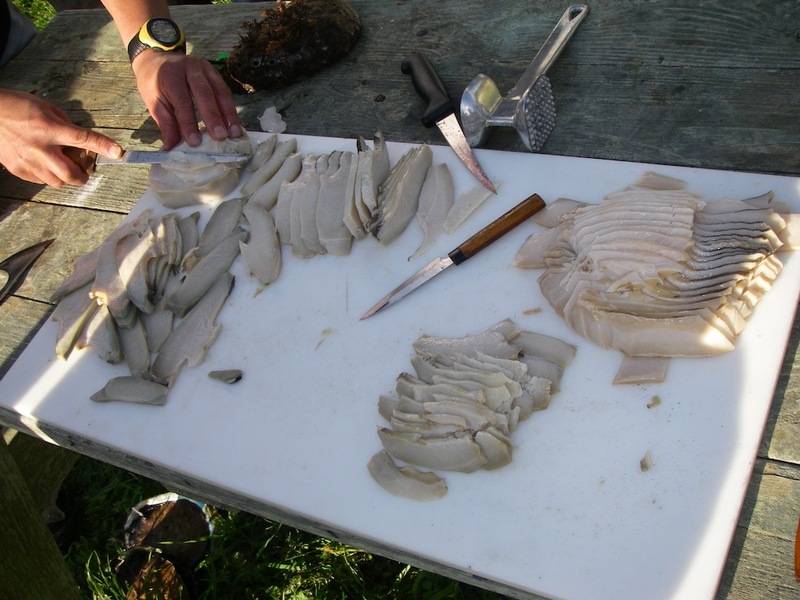 We can easily collect from 5-8 abalone and then the process begins. The cleaning and pounding and cooking oh my. 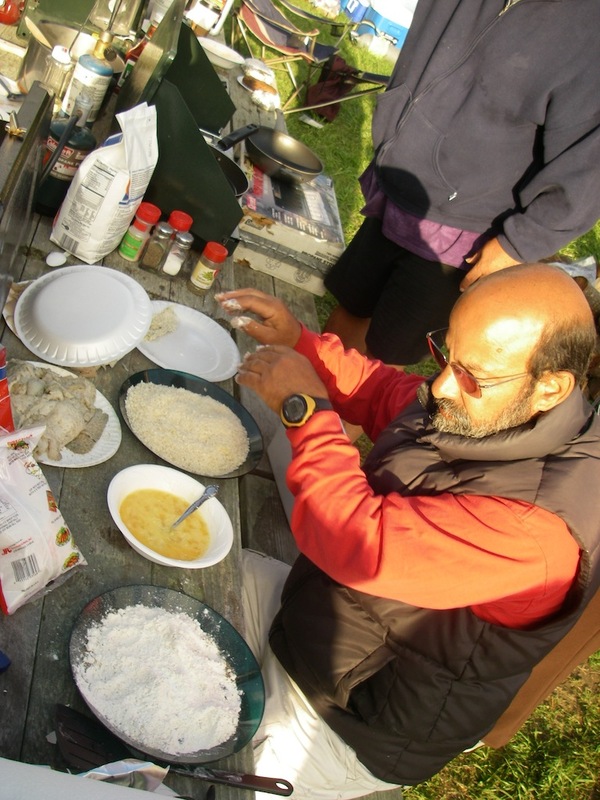 With several cooks at several stoves we usually have a variety of abalone dishes. My favorite doesn’t even require cooking with heat. This Abalone Ceviche is awesome. Thinly sliced then pounded and cubed the meat is then marinated in lemon or lime juice for several hours maybe once pouring off the milky juice that accumulates and adding fresh juice. Once that is done the chopping of tomatoes, red onions and some cilantro happens. Then the meat and veggies are stirred together to let sit for an additional hour and then, only then, are we allowed to dig in. Next time I’ll take some pictures for you. There are also plates of abalone fried up after being floured, breaded or panko’d and usually at least one is pounded whole and then baked in foil on the grill with maybe a little butter and garlic in with it. Superb. There is so much abalone one might think we’d get sick of abalone and one would be wrong. After the Saturday feast another custom is to take a slow boating trip up the Albion River and past the floating houses. 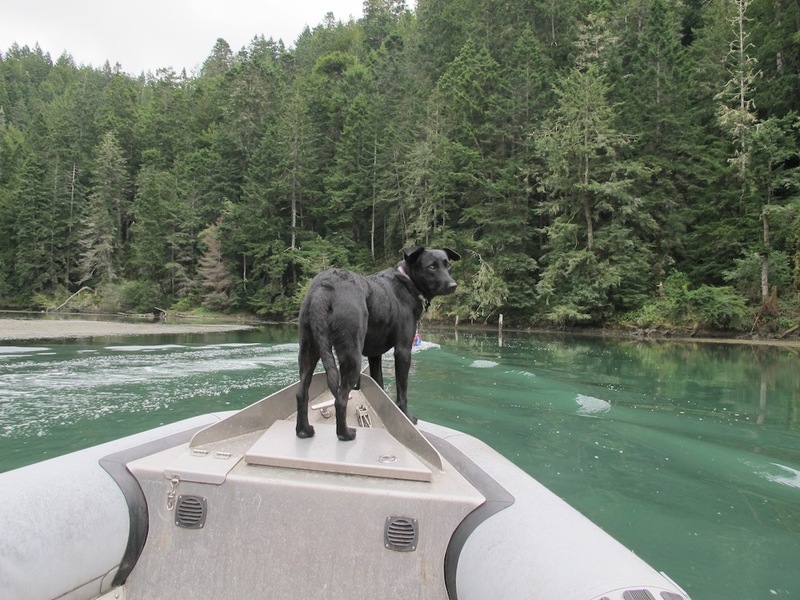 This is always a fun time for the dogs that like to be on the boats and Willow likes boats. Her specialty is making the driver of whatever boat she ends up on nervous that she is going to fall in the water and get run over. 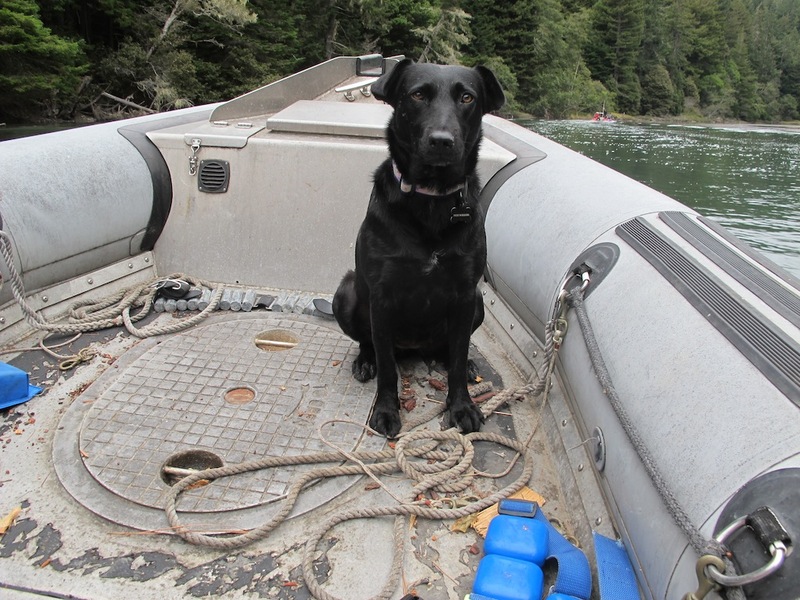 That was Juneau’s, one of Willow’s best buddies, first time to Albion and first time on a boat and she did very well at both and was invited back. Sometimes we pull off to the side of the river bank and let whichever dogs want out to go romping in the forest. 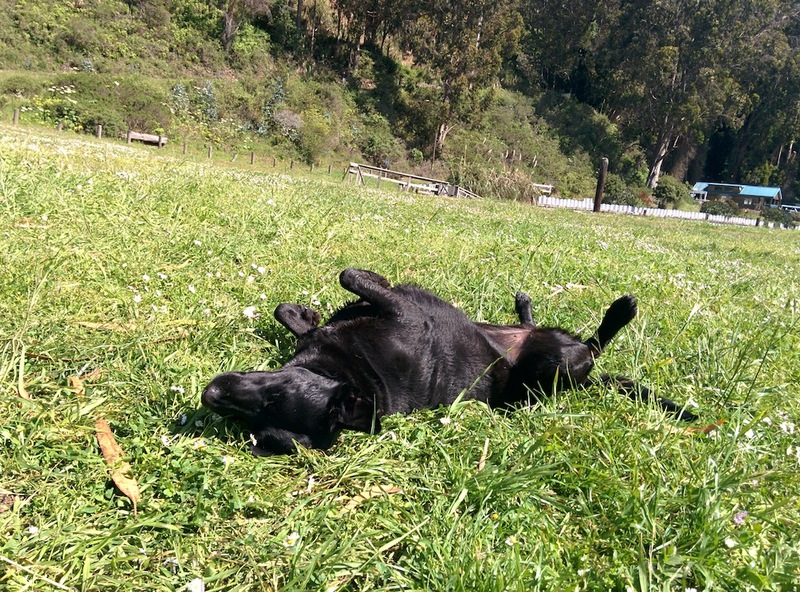 Willow always chooses the romp. 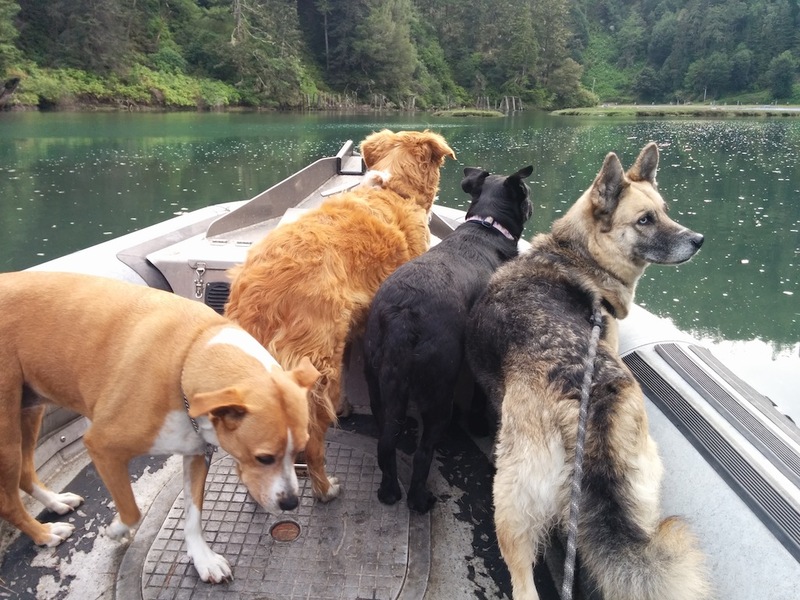 Then, to mess with her/them, we slowly pull away and start heading back down the river with the dog(s) tagging along on shore. 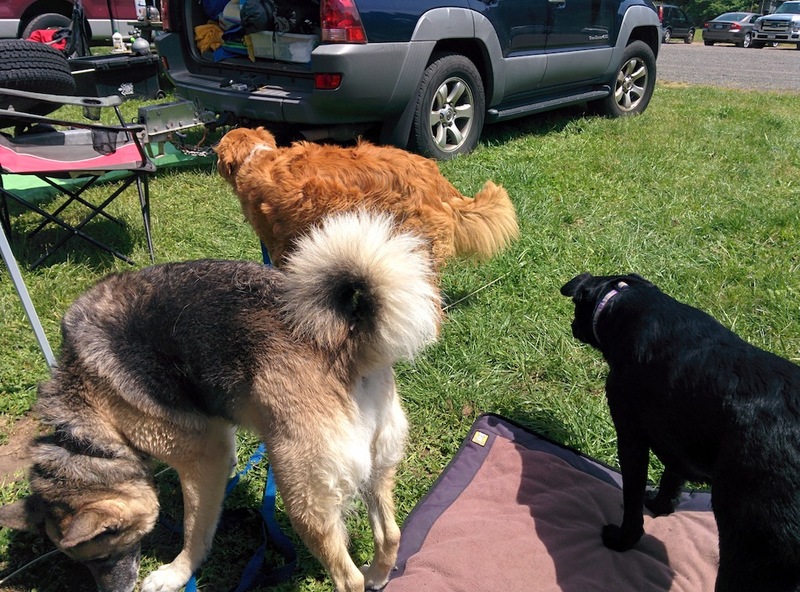 Great fun is had by all and the dogs get an awesome workout and sleep like logs that evening. 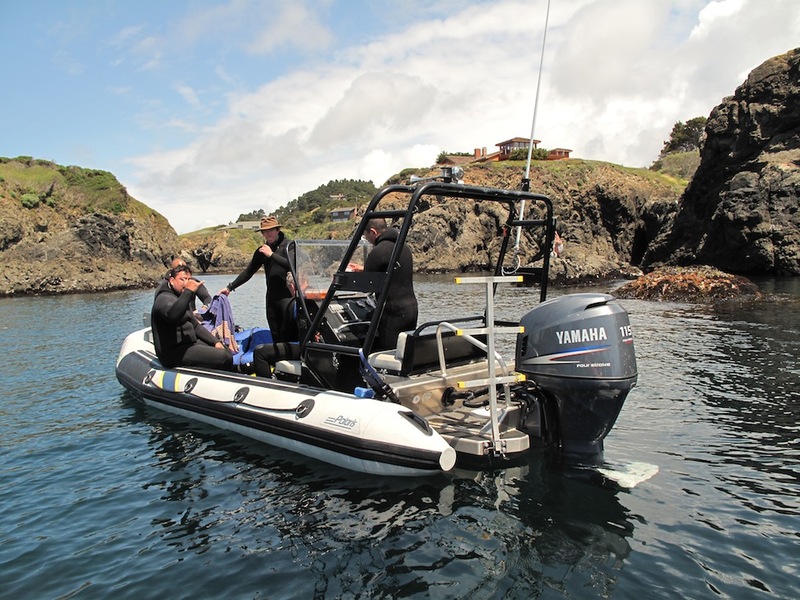 On Sunday morning, depending on the weather and how many are willing sometimes there is another trip out to catch abalone or go spear fishing for Ling cod in some of the rocky crevices out near the pinnacles. This is a great way for someone who gifted an abalone on Saturday or who didn’t limit to top off their allowed three abs in possession. A couple of the more successful guys usually gift or donate all the abs they catch on Saturday so that they can, hopefully, limit again on Sunday and head home with three fresher specimens. Other times life gets in the way and everyone just packs up and heads back to their everyday lives. If we can swing it at all Willow and I usually stay over one more night. That way we end up having the campground almost completely to ourselves and the drive on Monday is always better than weekend traffic.